Scale 3ft to 1in. The acute angle made by the extended Lothbury front with that along the new Princes Street presented considerable problems visually. Soane’s process of design was at its most complex in developing a monumental composition which would not only mask the angle but also do justice to the distant view of the bank along Gresham Street. In the folder of drawings to this feature (1/6) the architect’s ideas oscillate from one concept to another, often reverting to earlier themes when the design appeared to be resolved. Soane’s earliest concept, represented by a series of undated drawings, was a triumphant arch reminiscent of Bullion Gateway. 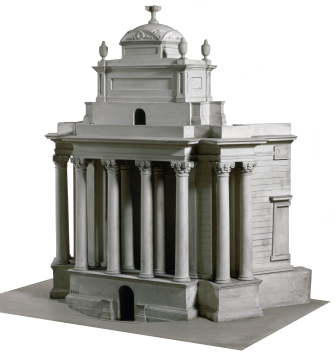 However, the main characteristics of the design shown by this model appear with variations in dated drawings from mid-September to early October 1804, one of the closest being for 3 October (6/9). The value of this model in the process of assessing aesthetic factors is revealed in an unexpected way. By removing a small panel at the back (as also in MP225) a spectator’s-eye-view can be obtained from inside the composition looking out through the principal colonnade. Almost predictably, it was the ornamental character of the attic in this design which gave Soane most trouble. Two models: DR6 and M1267 to the same scale as this model are variants of the attic, the latter with a section of wall to either side anticipates the design of model MP225.